DHX Television announced today the global phenomenon and multi-award winning kids’ TV show Teletubbies will be coming to its rebranded preschool channel Family Jr. in late 2015. Starring the timeless and unique costume characters Tinky Winky, Dipsy, Laa-Laa and Po, the beloved series is reimagined for a new generation with a CGI-enhanced aesthetic. The series pickup consists of 60 brand new 12-minute episodes produced by DHX Media, each featuring an original adventure with a strong focus on exploratory fun. The return of this iconic property complements the make-believe and imaginative play focus of Family Jr.’s brand, which strives to captivate young hearts and minds through comedic and playful storytelling. With rewarding rituals, sound play and physical comedy, new-generation Teletubbies will build upon many familiar and beloved features of the original series, but offer some exciting and surprising new developments too. With the Teletubbies landscape replaced and replicated by a beautiful, detailed model that will be enhanced via CGI, there will be freedom to apply large doses of creative imagination to Teletubbies stories. The wonderful new world of the Teletubbies will resonate with young preschoolers, reflecting child development and learning in a stimulating and contemporaneous manner. In addition to its updated look and feel, the exciting new series welcomes a remarkably talented voice cast including Jane Horrocks (Absolutely Fabulous) as the Tubby Phone; popular British television and radio presenter Fearne Cotton and Academy award-winning actor Jim Broadbent (Iris, Harry Potter) as the Voice Trumpets; and up-and-coming actor and comedian Daniel Rigby as the show’s narrator. Antonia Thomas will narrate the opening and closing lines. Global phenomenon Teletubbies first launched in March 1997 and became one of the most successful global children’s brands of all time. It has reached over one billion children to date and the original episodes have aired in over 120 territories in 45 different languages. It was the very first western preschool property to air on China’s CCTV reaching an audience of 300 million children. In September 2013, DHX Media acquired all rights to Teletubbies through its purchase of Ragdoll Worldwide, a joint venture between Ragdoll Productions and BBC Worldwide that owned, managed and exploited Teletubbies programming. Multi award-winning, Teletubbies is designed to encourage young children to watch television creatively. Full of fun and exploration, it inspires confidence and curiosity and nurtures childhood development. 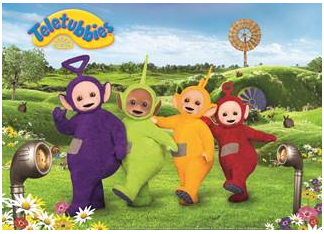 DHX Media has engaged award-winning UK production company Darrall Macqueen to produce Teletubbies. Together they are pioneering a 21st century version of the show for a new generation of viewers. This entry was posted on Thursday, June 4th, 2015 at 7:47 am and is filed under National News. You can follow any responses to this entry through the RSS 2.0 feed. You can leave a response, or trackback from your own site. » 2015 » 06 » 04 » DHX Television Brings Rebooted Teletubbies Series To New Preschool Lineup Set For Family Jr.